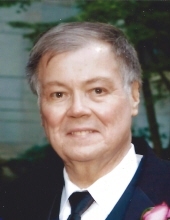 Jerry Reid Costner entered into his eternal grace and reward with the Lord on February 5, 2019. During his time with us, he was an exemplar of love, patience, understanding, devotion, generosity, humor and quiet strength. He will be missed immensely by his family who were truly blessed to have had him as a husband, father, and Pops. Jerry is survived by his wife Brenda (Azar) Costner, daughter Marisa Costner, son Brian Costner, Daughter in law Cara Costner, Granddaughter Quinn Costner, Grandson Charlie Costner, brother in law Michael Azar, and niece Shirley Hachey. Visitation, Sunday, February 10, 2019 at A. S. Turner and Sons Funeral Home from 2-4 PM with Rosary at 4 PM. Funeral service at The Cathedral of Christ the King on Monday February 11, 2019 at 10:00 AM. In lieu of flowers, the family requests donations be made in Jerry’s name to St. Jude Childrens Hospital or Our Lady of Perpetual Help Cancer Home. To send flowers or a remembrance gift to the family of Jerry Reid Costner, please visit our Tribute Store. Rosary will follow visitation at 4:00 pm in the Chapel of A. S. Turner & Sons. "Email Address" would like to share the life celebration of Jerry Reid Costner. Click on the "link" to go to share a favorite memory or leave a condolence message for the family.